Live albums are a mixed bag. Usually, they're either not-so-good or somewhat mediocre. 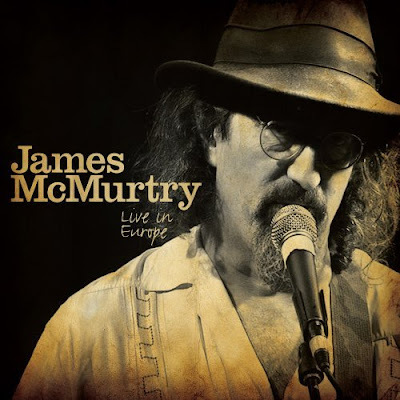 However, James McMurtry's new CD & DVD "Live In Europe" defies expectations. It's a barnburner from beginning to end. This is the first time fans can purchase video footage of James McMurtry, and the two discs - clocking in at about 40 minutes each - share only two of the same songs. So it's a great value. Actually, the success of "Live In Europe" should not be that big of a surprise, because James McMurtry's terrific 2004 release "Live In Aught-Three" proved that he knew how to make a successful live album, but "Live In Europe" even trumps the 2004 release because of his sincere vocal performance. The CD begins with the rockin' "Bayou Torture" and is followed by the new classic "Just Us Kids." James McMurtry's live version of "Just Us Kids" shows a new side of the track, and his passionate intensity is on full display. "Hurricane Party" has beautiful instrumentation that eloquently showcases McMurtry's lyrics, and it's the best moment for the band. But the CD's biggest surprise is "Fraulein O," which was especially well received by European audiences. "Live In Europe" was recorded in Amsterdam, The Netherlands and Geislingen, Germany. The best performances from these two locations were used for the album and DVD. The CD's best track is "You'd A' Thought (Leonard Cohen Must Die)." The song is perfect in almost every way, and it's also one of James McMurtry's best performances on any live or studio album. "Ruby And Carlos" showcases James McMurtry as a world-class storyteller. The rest of the CD is a rollicking good time with the upbeat cuts "Restless" and "Freeway View." The DVD includes an almost ten-minute version of "Choctaw Bingo" and an amazing live performance of "We Can't Make It Here." Jon Lee Graham joins McMurtry on "Laredo" and the DVD is rounded out by an extended version of "Too Long In The Wasteland." The production of the DVD is excellent and should please both new fans and old. Review: The Avett Brothers "I And Love And You"
What's New: Derek Sholl "Derek Sholl"
Review: Mark McKinney "Middle America"
Review: Pamela Danzy "Let Me Be Me"